"Shmura Matzo" by Yoninah. Licensed CC BY-SA 3.0. My question is, why are hand matzos circular? It seems sefardim and ashkenazim make them like this, which suggests this is a universal minhag of some sort. Are there halachic or midrashic or kabbalistic reasons why this is so? In שו"ת מהרי"א סי' קנ"ז (seen here and continued here), it speaks about the shape of matzos being specifically round. This was written during the period of controversy regarding machine matzos. The word עוגה (as in עוגות מצות) means round. At first glance the word "עוגות" is superfluous; why do we need to know what shape they made their matzos? And even if there is a need for it, we can infer it from the פסוק which says they didn't have time to make leavened bread, and the fastest way to roll a dough is into a circle. Therefore, there must be a reason why the Torah tells us they were made round - because we should also be making them round. 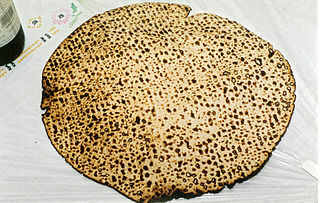 Matzos are called "לחם עוני". Poverty is like a wheel that turns, hence it is round. תשעה באב falls on the same day of the week as the first night of Pesach. Therefore, as a remembrance for the אבילות on the חורבן, we eat eggs by the seder; for the same reason the matzos are round. At the time, the law in מצרים was that one made his bread in a triangular or squared shape according to how many "gods" he believed in. Therefore, in order to separate themselves from this, the Jews made their breads round, signifying the Oneness of Hashem. Not the answer you're looking for? Browse other questions tagged minhag passover matzah . Why are some Shmura Matzos hard and some shmura matzos soft? What are “18 minute” matzot?